It’s time to reveal some clues about mysteries in the world of Lost in Sky: how did ARK originate? Where did the majority of the world’s population disappear? And, in the end, what happened to our planet? However, you should not expect to find out everything right here, right now – it would be too simple and uninteresting. 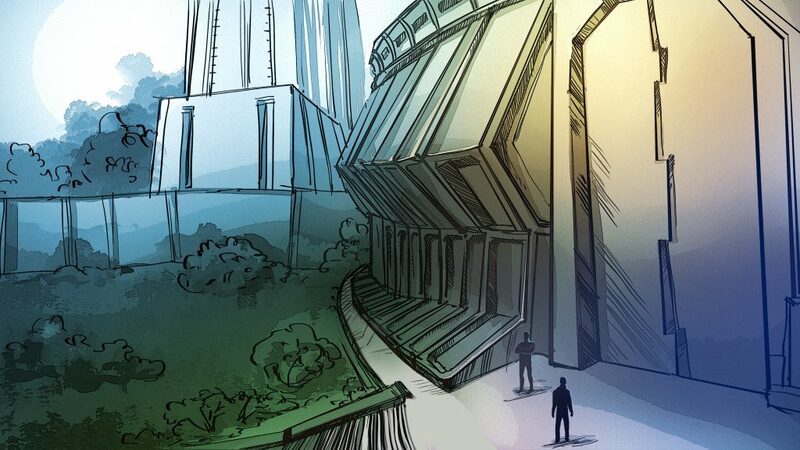 We are glad to present you a small fragment, which will form the basis of our graphic novella’s plot and help you to learn a little more about the events that preceded the appearance of ARK. …He was standing there and watching. His gaze was gliding along the horizon drenched in smoke of crimson flames, shepherding slow-moving sun to its cradle in the east past the burned wasteland and ruins. His last stare. In his childhood, he read books, that told a grim tale of humanities pitiful demise. He loved reading them. Back then he couldn’t yet imagine that he would be one of those few to remain standing. He was standing there in doldrums, the state which for him seemed eternal. And there was no cause and no remedy for it, because now it all became part of his new existence, his new universe. The universe cold and dying, which he has to stride up to the very end. And one couldn’t do anything about it. The sounds were hardly penetrating his flight suit. But the hum and vibration from his shuttles engine behind him were clearly felt. That was the last shuttle salvaging the last remaining survivors from Earth. He was granted permission to descend with the shuttle for the last goodbye with his beloved, but fatally wounded planet. Yet nothing in this universe is permanent, the planet will heal, the nature will recover one way or another, but humanity here will be no more. He could hear second pilot’s voice telling briefly: “Captain, t minus 1 minute”. One minute until this last shuttle will be forever gone. Anyone alive would give up anything for this ride. The last 60 seconds were ticking. He didn’t want to go. Here on Earth he could’ve still help someone, save more people, he could’ve gamble fate for more lives. – Captain, t minus 30 seconds! – He heard on the intercom. Yes, could’ve help, he could’ve stop the countdown, but he was responsible for the survivors on board the shuttle. And this was far above his personal will.